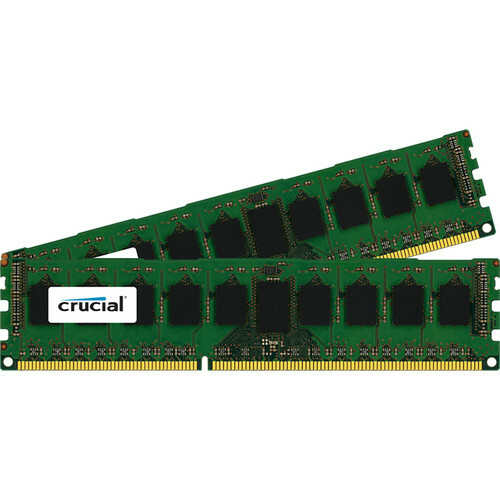 The 16GB DDR3L 1866 MHz UDIMM Memory Module Kit from Crucial comes with two 8GB modules that are designed for desktop systems. Each UDIMM module is compatible with systems that have an available 240-pin memory slot. For performance, it runs at a speed of 1866 MHz (PC3L-14900) and has a CAS latency of 13. Additionally, the DDR3L memory chips require 1.35V of power. Box Dimensions (LxWxH) 5.5 x 2.3 x 1.0"
16GB DDR3L 1866 MHz UDIMM Memory Module Kit (2 x 8GB) is rated 5.0 out of 5 by 1. Rated 5 out of 5 by Ashish G from Fast RAM and quick shipping I used this RAM for one of my clients OptiPlex machine and it is working in 2 machines and its fast. Client has seen improvement in the performance of their machine since the upgrade. Thanks to B& H for their quick and free hassle free shipping to Canada. I have used crucial products for my other clients and never had a issue . Their support is awesome.